No one likes referees, certain ones in particular. They always try to ruin your fun on the field, they favor the other team, and call you for fouls you definitely didn’t commit. Even referees don’t like themselves, or so I’ve been told. Thinking about why anyone choses it as their line of work melts my brain, as I can’t see any logic in doing so. 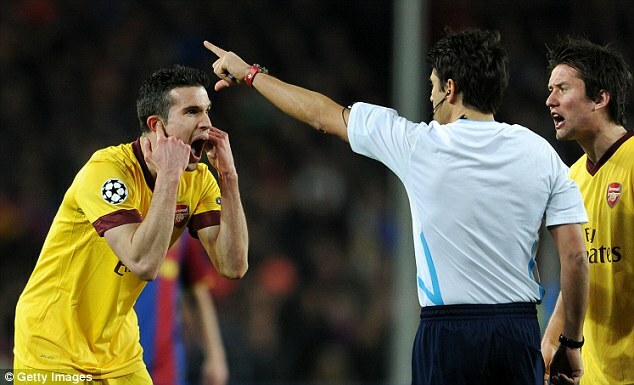 van persie had reason to scream, along with many others, over the past few weeks. Unfortunately, no matter how much we hate them, referees are a necessary evil. Let’s be honest, we players can’t be trusted to police ourselves. If for some reason we were left to do so, we would have infinitely more bruisers like Nigel de Jong, and virtually zero finesse players like Messi. Without them, Rino Gattuso likely would have killed someone by now. And while I’m on this honesty kick, I’ll even admit that I think that officials actually have a pretty hard job. You’re not only expected to be the final judge on all 22 players on the field, how they’re behaving, and where the ball is in relation to the pitch, but do all of that at the same time. The modern game has become so lightening quick that decisions on offsides or late tackles occur in a span of milliseconds. That’s just a sliver of time to make a snap judgment on whether to blow, or not to blow (get your mind of the gutter) one’s whistle for a possible offence. It’s miraculous just how often they do get the calls right. In the world’s top competition, one could expect to see the best officiating, right? Wrong. The most heated and controversial call recently was van Persie’s second yellow in Arsenal’s second-leg Champions League round of 16, awarded by Massimo Busacca for “time wasting.” This despite the fact that he had the ball for less than one second before shooting it wide by just a few feet, unable hear the whistle because there are 98,000 screaming fans. Also, be sure to keep in mind that this would all be moot if Rickety Robin had been properly sent off for his earlier missed stamp on Messi. Somehow, this went unpunished as well. Handling a particularly rough World Cup final to generally positive reviews (except for maybe this), the normally decent Howard Webb didn’t like the way that Shakhtar’s Darijo Srna reacted to having Daniele de Rossi’s elbow parked in his face, so he carded him. 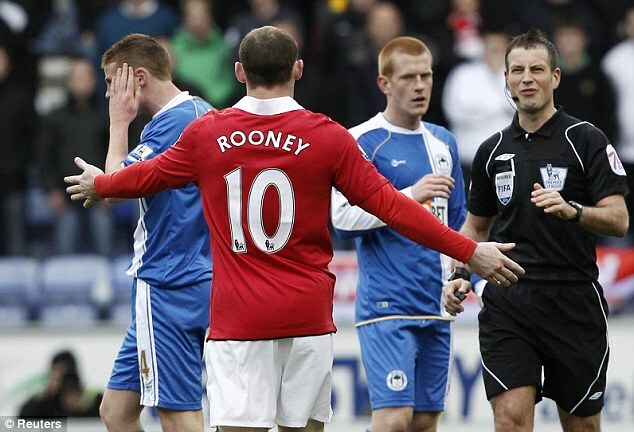 clattenburg thinking really hard if he saw wazza misbehaving. Martin Atkinson sent off Vidić for a second yellow, despite allowing Chelsea’s David Luiz to get away with an equally violent second yellow card offence minutes earlier. At least Fergie didn’t mind. Anthony Taylor and his linesmen twice baffled the Arsenal faithful against Sunderland. First they ignored a blatant penalty when Arshavin was two-arm shoved by Titus Bramble. Then they disallowed Arshavin’s 87th minute winner because he was not offsides. Superdouche Mark Clattenburg has continued on his moron march through the 2010/2011 Premier League campaign, with two major gaffes in the last two weeks. He somehow missed Wayne Rooney pile driving James McCarthy’s face, despite standing just a few yards away. Then he awarded a dubious penalty to Fulham. Why none of us expect this from Clattenburg yet is beyond me. Peter Walton was charged with overseeing the midweek clash between Birmingham City and Everton, and forgot his cards in the dressing room. This one would have flown under the radar had it not been for Jordan Mutch’s 40th minute yellow. You’ll get sent off for tackling a fan in a mankini who invades the pitch; even the lower leagues aren’t immune! And even though they’re not from the last few weeks, I would be amiss to not mention the poor showings during the World Cup. Look, I know these guys aren’t perfect. They’re going to miss things from time to time; it’s human nature. Poor decisions will be made and they are rarely reversed, no matter how horrid the mistake. With that in mind, you can understand when I say that my complaint isn’t really with the referees, despite their obvious involvement. As it turns out, my complaint (once again) is with FIFA. First and foremost, FIFA need to end the pointless policy of not allowing anyone complain about the officiating. I get why they don’t want to be advertising bitching and moaning about the refs, a part of their larger “respect” initiative, as we can’t have kids calling their referee a chav every time they don’t agree with a call. But this rule needs to be done away with for the pure reason of fairness. After each game, leagues require that their manager and players meet with the press to answer questions about the match. “Why did you choose to do this?”, “What are your thoughts about this decision?”, and “Why did your team lose?” These types of questions not only force the players/managers to explain their actions, but also are meant to bait the players into complaining about the referee’s decisions. Bite your tongues boys, as you can expect a charge from your FA if you voice to strong of an opinion. So what they’re doing is placing them to come and give their thoughts to the press, but still strictly forbid them from speaking their minds when they answer the controversial questions with which they are being forced to field? That’s not fair. If the players and managers are being forced to explain themselves, why aren’t the referee’s forced to do the same thing? Make Busacca stand in front of all the mics and cameras and explain how he expected van Persie to hear a whistle over the roar of one tenth of a million people. Even more satisfying, we could drag Clattenburg into an interrogation room and make him answer for all of his bad crimes calls over the last decade. Secondly, FIFA need to quit dicking around and start providing the refs with some help, in particular with goal line decisions. While the addition of head sets to help the referee communicate with their linesmen is a step in the right direction, utilizing end line officials in a very small percentage of the competitions is not appropriately addressing the issue. Another set of eyes can’t eliminate the human error, it just lowers it. my tv and a dvr remote are all the technology fifa would need to give refs a hand in making the right call. The technology already exists to give quick and accurate review of close goal line calls. It’s called HD TV and a DVR, and I use it every day in my living room. This space age technology allows me to rewind the video, slow it down, look at it frame by frame. You wouldn’t even have to stop play to verify calls, as a one of your 4th official could review and relay to the man in the middle, who can then blow his whistle if he’s been told that a goal should have been awarded. Of course FIFA thinks this technology only exists as an idea in the future, and unfortunately Sepp burned his bridge with Marty McFly years ago. With such important issues to consider and refereeing dominating the headlines, it’s a good thing FIFA’s rules committee convened a few weeks ago. Or so you would think. Like I wrote earlier, we need referees. The game we all know and love would be difficult to call a “beautiful” without them. We know too that they are humans, and they’re bound to make some mistakes here and there. But FIFA are slacking on both holding them accountable for their decisions and in helping them to make them consistently and accurately. Simply put: it’s time for the governing body to wake up, catch up with the times, and do it in a hurrry. Previous Post: i want to be in that number!